Most rubber engineering composites involve the incorporation of rubber and metal, bonded together to make engineering components. The bonding system is made up of two components, namely, an adhesive and a primer coat. The primary function of the primer coat is to enhance the corrosion resistance of the metal substrate, while the adhesive is used to bond the rubber to the coated substrate. In some cases, the use of these composites involves exposure to aggressive environments, as those experienced in offshore structures as well as road vehicles in temperate countries. Under wet and highly saline environment, the metal substrate undergoes corrosion resulting in the failure of the composites. The conflicting conclusions drawn from previous studies indicate that the mechanisms of rubber to metal bond failure after exposure in salt water environment may not be fully understood. The understanding of the mechanisms and reactions involved during the actual disbonding activities is less than satisfactory, which opens this issue for further investigation. Thus, this work aims to evaluate the adhesion failure mechanism of rubber bonded to mild steel when exposed to a marine environment using a commercial two coats bonding system. 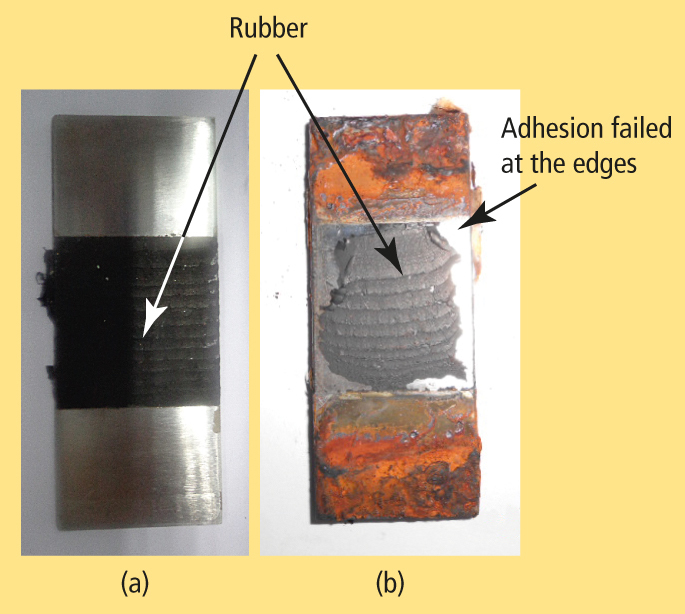 The adhesion failure under alkaline medium, cathodic disbonding and anodic undermining were analysed in this study in order to provide a description of the failure mechanism of the test samples. A simulation study carried out as a salt spray test indicated that corrosion of the exposed metal substrates induced the loss of adhesion through cathodic disbonding. Laboratory exposure to an alkaline medium, cathodic disbonding and anodic undermining tests suggested that the hydroxyl ions generated from corrosion reactions contributed to the adhesion failure. 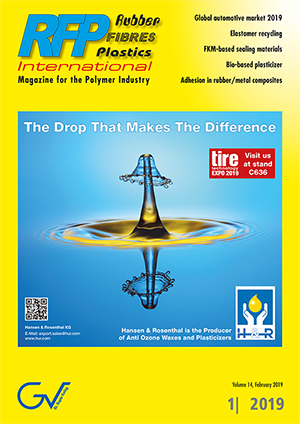 I. Ismail, M. K. Harun, RFP Rubber Fibres Plastics, 01|2019, 49-55.